LOVE YOUR WORLD! 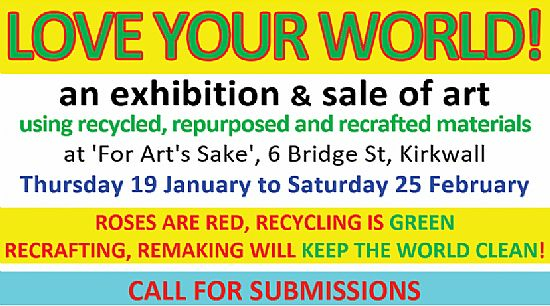 is an exhibition & sale of art using recycled, repurposed and recrafted materials that will take place at 'For Art's Sake', 6 Bridge St, Kirkwall from Thursday 19 January to Saturday 25 February. RECRAFTING, REMAKING WILL KEEP THE WORLD CLEAN! We'd LOVE to see your ART..beautiful things made with recycled stuff…from clothes, cardboard and cans to bruck from the beach ... junk from the shed ... and undiscovered treasures from the Orkney Zerowaste Yard. You can submit work up to 12 noon on Monday 16 January – but please register first. Registration forms can be downloaded from this page. Please email orkneyzerowasteyard@gmail.com with any questions - or if you'd like to pick up a printed registration form.